Each decade of that World Mission Rosary calls to mind an area where the Church continues her evangelizing mission: GREEN for the forests and grasslands of AFRICA; BLUE for the ocean surrounding the ISLANDS OF THE PACIFIC; WHITE symbolizing EUROPE, the seat of the Holy Father, shepherd of the world; RED calling to mind the fire of faith that brought missionaries to the AMERICAS, and YELLOW, the morning light of the East, for ASIA. Our Holy Father, Pope John Paul II, encourages everyone to “intensify your praying of the Rosary…to obtain from the Lord those graces that the Church and humanity especially need." 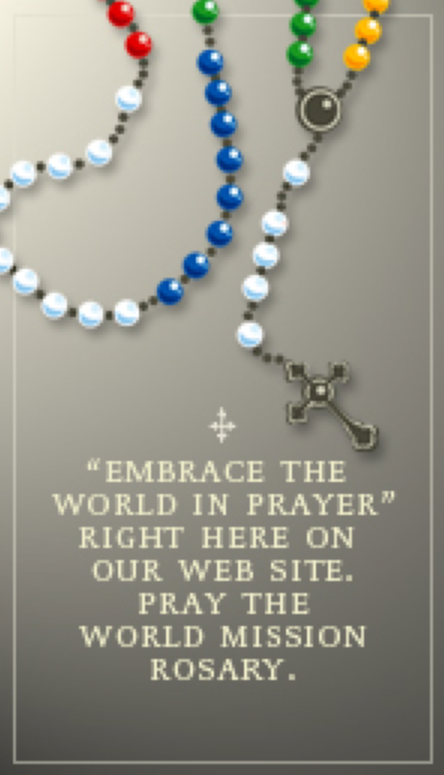 The World Mission Rosary is available through the Society for the Propagation of the Faith for a suggested offering of $10 (comes with information / prayer booklet). Children's Rosaries are also available for a suggested offering of $5 each. Heavenly Father, source of all good and all holiness, You reward those who love and serve You faithfully as Your sons and daughters. 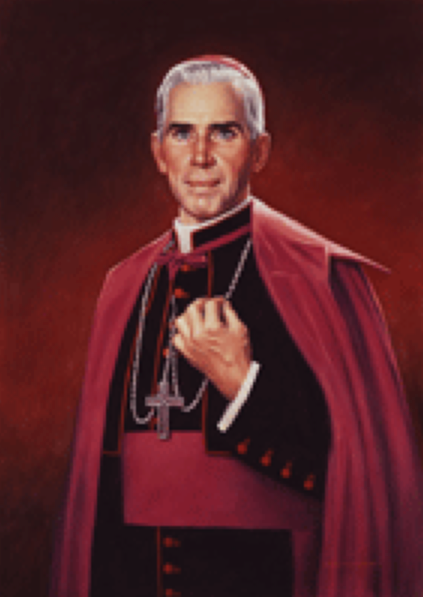 If it pleases You, I ask You to glorify Your servant, Archbishop Fulton J. Sheen. He touched countless lives by his ministry of evangelization, especially through the media. His clear and courageous teachings about Jesus and the truths of the Catholic Church seemed to possess a special power of the Holy Spirit that strengthened the faithful and inspired many converts to embrace the faith. He supported the needs of missionaries all over the world through his work in the National Office for the Propagation of the Faith. He also labored zealously for the renewal of the priesthood by preaching retreats to his brother priests and by encouraging them with the good example of his daily Eucharistic Holy Hour. His deep personal love of Our Lady moved many others to go to Jesus through His Mother. Heavenly Father, if it be according to Your Divine Will, I ask you to move Your Church to glorify Your faithful servant, Archbishop Fulton J. Sheen. I ask this prayer in Jesus’ name. Amen.